Around the World with Newbery and Caldecott! As many of you know, I’m hosting a Back-to-School Literature Soirée in two weeks. In preparation for this, I’ve been reading some current medal winners as well as pulling lots of old Newbery and Caldecott Medal winners from my shelf and rereading them. This is such a delight! While I am learning new things, I am also taking a trip down memory lane, as rereading these treasures brings back reflections of how these books affected me when I first read them. I have been struck by how reading these award-winning books can be a veritable trip “around the world”, as so many of them have to do with cultures, nations, and historic periods completely outside of our own familiar and comfortable world. For the upcoming soirée I will present an “Around the World” with Newbery and Caldecott Medal winners. We will take a trip through various nations, cultures, and historic periods through treasured classics. 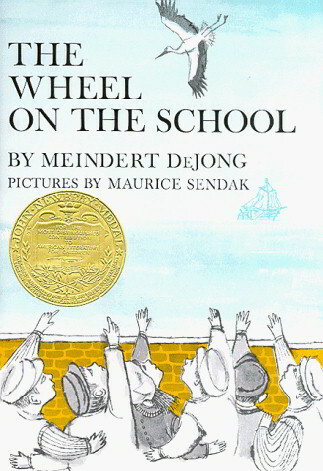 Here’s an example of what our “trip” will look like: We will travel to Holland through the wonderful works of Meindert DeJong, in The Wheel on the School and Journey From Peppermint Street. 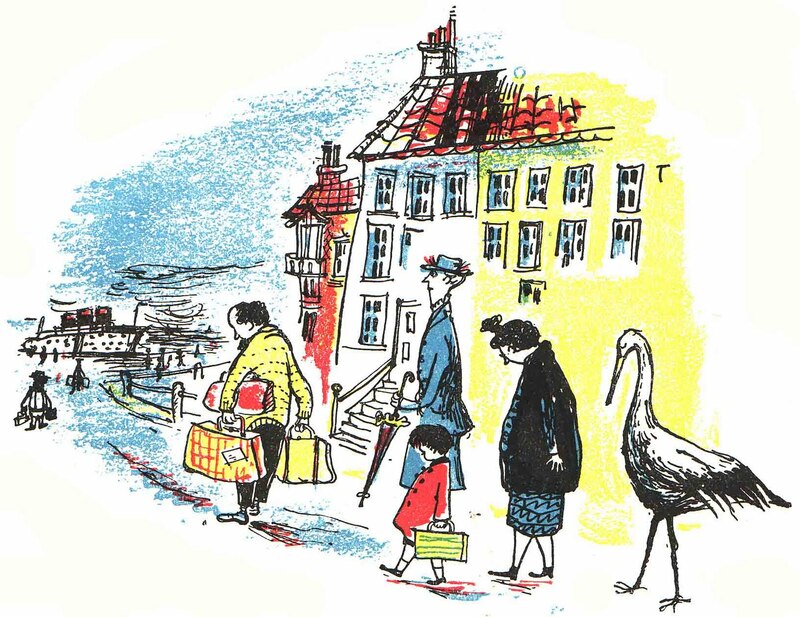 In the first book, we get a charming look at life in a fishing village in Holland when the school children place an old wagon wheel on their school so a mother stork will build her nest. This tender and touching story won the Newbery Medal in 1954 and continues to have a place in the hearts of children today. In Journey from Peppermint Street, young Siebren goes on a long journey with his grandfather and in the process learns valuable lessons about the joys and mystery of life. Yonie Wondernose by Marguerite De Angeli won the Caldecott Honor in 1945 and concerns a Pennsylvania Dutch boy named Yonie who lets his curiosity get him into all kinds of scrapes. 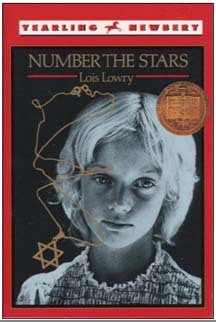 Continuing our European tour a bit north to Denmark, Number the Stars by Lois Lowry is an inspiring story set in Copenhagen during the Nazi occupation of Denmark. Lois Lowry, (who I was able to meet just recently in Boston!) has created her story based on the Danish people’s rescue of the Jews through the inspiring example and leadership of their King Christian X, and the profound courage of the Danish Resistance. Ten year-old Annemarie Johansen risks her life to save her best friend Ellen Rosen and learns the meaning of courage and self-sacrifice. If the plight of storks has peaked your interest, you can continue reading about these marvelous creatures through a lighthearted and whimsical tale, also set in Denmark (and London) about a family that saves an abducted stork! Mrs. Easter and the Storks by V.H. Drummond will delight your youngest readers with its fun and adventure! Another award-winning work on Denmark is Chase Me, Catch Nobody by Erik Christian Haugaard which won the Jane Adams Book Honor in 1981. It involves a 14 year-old Danish boy on a school trip to Germany in 1937 who becomes involved in the activities of the anti-Nazi underground. 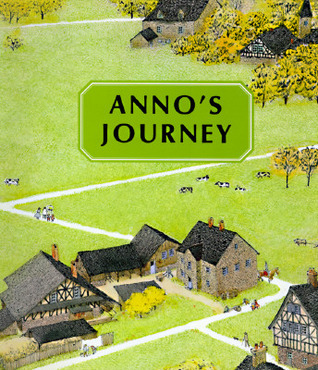 You may recognize this award-winning author from his more well-known work set in 16th century Japan, The Samurai’s Tale. So, this is just a little preview of the upcoming journey we will take through treasures old and new during my upcoming Back-to-School Literature Soirée. Our journey will also take us to Japan, China, England, Korea, and even into the future! There are still spots available, so if you are interested, visit my last post for info, or to register visit here.